Yo Tours invites you to the center of Varanasi to experience street food crawl and Indian cooking classes as well as the mysticism tour of Varanasi, Sarnath tour, and morning ghat walk. If you are a seeker and looking to experience Varanasi in a manner it was built for, this tour is promised to be the most fun, engaging, and enhancing experience you will ever have. You will finally understand why this has been such a talk about a place. You will also make a powerful impression with the local cuisine as well as learn the history, culture, and true essence of the city. Feel Varanasi in a spiritual state! You will be accommodated at a three-star hotel or homestay in the city central area. The options of twin sharing and triple sharing are available as well as a single occupancy. In the afternoon, you will check-in at your lovely homestay or hotel, unwind, and refresh yourself. 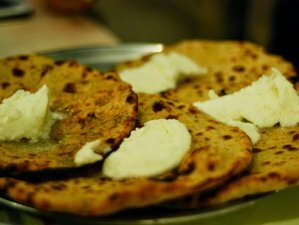 You will start your culinary vacation by taking the street food crawl of Varanasi. The walking tour of the old city will give you a glimpse of the local life, its food, and its culture. This is an ultimate tour for foodies looking to explore the city's cultural diversity through food. Then, you will join your group for the mysticism tour of Kashi, unraveling the mysteries of life, death, and beyond and understanding why Varanasi is mystical. It includes a complimentary boat ride and you will listen to awesome stories. Your first day comes to an end with a dinner at a locally famous place. Here, you will make a powerful impression with the local food. You will start your day with morning ghat walk, a walk along the ghats of Varanasi is a unique experience for you will learn about the colorful mélange of different people; Hindu gurus doing meditations and prayers on the stairs, international tourists having a cup of chai, little Indian children who are trying to sell candles and flowers, and many more. You will enjoy your breakfast at a local stall with the locals and continue your spiritual journey by taking a guided Sarnath tour. You will explore the Sarnath; an important Buddhist pilgrim spot where Buddha made his first sermon after getting enlightenment. Temples, stupas, monuments, famous tourist attraction, and pilgrim spots visits will fill your day while you listen to awesome stories that you will remember a lifetime. Then, you will start your evening with the tour of hundreds of years old spice market, sip a cup of masala tea in a clay pot on your way around different stalls. You will learn how the colorful spices commonly used in Indian cuisine, experience the smells and sounds of the spice market with this guided tour through its narrow streets and stalls selling herbs, spices, and other delicacies. You will enjoy your evening with food tasting at various cafes in Varanasi, try the variety of authentic Indian dishes, and finish your day by desert tasting tour. After breakfast, you will start your day with the old city heritage walk, explore the hidden gems of old Varanasi in a very interesting and fun way which will help you to develop a great perspective of the city and its culture. You will complete your culinary vacations in Varanasi with a host at home cooking kitchen to experience the real Indian cooking. You will learn the basics of home cooking and get to practice yourself a full meal, including snacks, curries, chapatis, and dessert. This is going to be an unforgettable experience full of cooking which you will remember for life. This tour takes place in the Eternal City of Varanasi, India. Locally known as Banaras and traditionally known as Kashi, this city is the oldest standing city on the planet right now and has been a hub for people seeking liberation and enlightenment for centuries. Yo Tours is a top and experienced tour provider offering a wide variety of culinary vacations and city tours in over 12 incredible cities in India. This vacation is available all year round. Please select an arrival date below. You will not be charged for children up to 5 years of age.